Beopgyesa Temple, Jirisan, Sancheong-gun, Sunday 8 September, 4am. It’s still pitch black. In parts, the sky is thick with cloud, but one or two stars manage to find a break to peek through. We set off up the trail, I with my head torch, and Mr Yoon using the flashlight from his mobile phone (he has brought along a spare battery). We are walking steadily, making reasonable progress but not rushing things. Mr Yoon probably thinks we’re going at a snail’s pace, but I’m determined not to over-stretch myself. There’s plenty of time to get to the top. Maybe half a dozen hikers overtake us as we ascend, but we’re not going that much slower than them, so I am not too disheartened. Mr Yoon pauses to take a photo as the sky begins to show its first glimmer of light, and announces to my surprise that we’re nearly there. It’s around 5:30am, but as we ascend the final stairs to the summit we realise from the excited hubbub that there are many more than half a dozen hikers at the top already. In fact there are closer to forty or fifty, and it’s a job to find a safe spot to sit on the jagged rocky outcrop at the summit. As we sit watching the sky, the temperature drops and the wind rises. We’re grateful that we’ve brought extra layers in our packs. The crowd is buzzing with excited chatter. The sky is developing perfectly, like ore in a steel foundry: as the temperature rises the orange-glowing metal throbs through the dark crust on the surface. And as the sun breaks through the cloud the crowd cries aloud to greet the new day. It has been worth all the effort. The sky is such a beautiful, constantly changing sight that as I ring Louise there’s a lump in my throat. I can hardly speak, and make my apologies that I have to take more pictures. In fact I take rather too many, but it’s better to have a big editing task rather than have too few images. Mr Yoon, wondering why I’m using the video function on my phone to take a panorama is good enough to show me how to take a still panorama shot. Having a Korean-made phone when visiting Korea has its advantages. As the excitement of the sunrise wears off, the hikers on the peak queue up to have their photograph taken leaning against the summit marker. It is all very organised and good-natured as people pass their camera to a stranger to take their picture, and then move away for the next person. 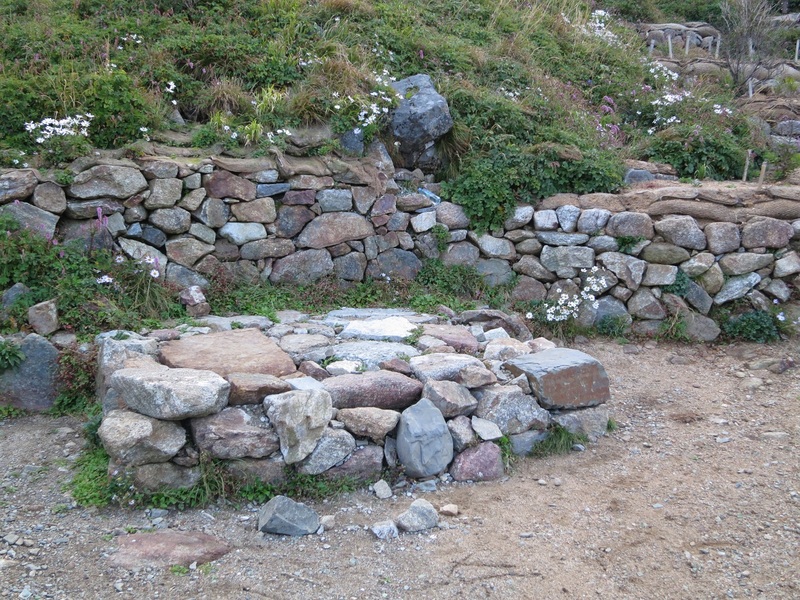 We take a stroll around the peak, noting a levelled-out area just the other side of the summit, on one side of which is a large altar made out of rocks. This is where a large sanshin-je is held once a year, the monks from Beopgyesa officiating, with a crowd of a hundred or so onlookers. As we look east, the sky has now lost much of its interest. All traces of orange and gold have turned a bright blue-grey. In compensation, the wild flowers have their colours revealed, and the light reflects off the clouds which fill the valleys like dry ice. The view stretches on an on until it disappears into the haze in the distance. As we start our descent, I’m surprised that there is a steady stream of hikers ascending to the summit. They have clearly risen early in the day, but too late for dawn. Why had they got up so early, but yet not early enough to greet the new day? I couldn’t figure out an answer to that one. It’s 6:30am by now – time to return to Beopgyesa for breakfast. But not before a celebratory herbal soju with some beef biltong, which Mr Yoon has hidden away in his backpack, to be brought out when we manage to find a quiet, comfortable spot where we can sit and enjoy the spectacular scenery. The soju has a dark brown colour, and has an indefinable woody taste. It warms up the insides, while the salty chewiness of the biltong starts awakening the appetite for breakfast. We continue our steady descent, noting the various landmarks on the way. 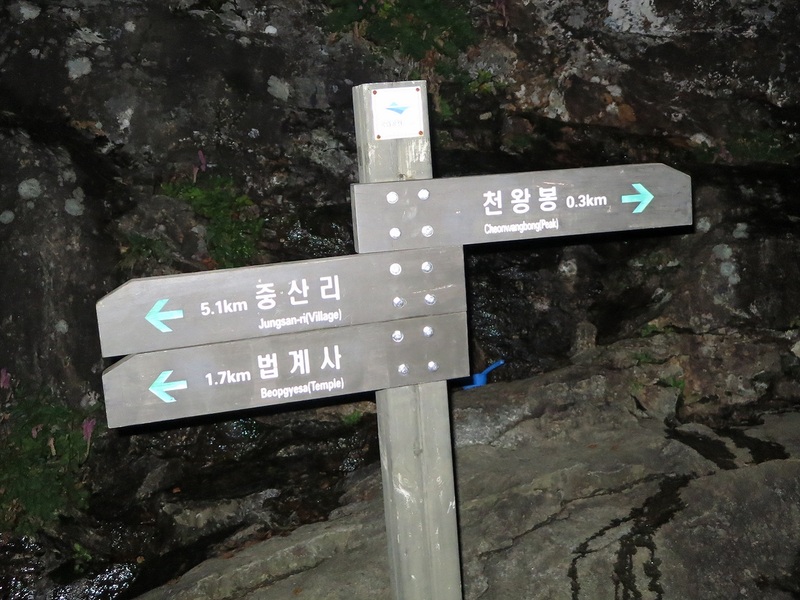 We take a drink from a spring which is source of one of the many streams which descend from Cheonwangbong. One or two of the eccentrically-shaped rocks have over time acquired their own names, helpfully written on a small notice board by the National Parks Service. The different vistas on offer make it perfectly understandable how a Confucian scholar could spend an afternoon contemplating a rock or a tree. On the way down Mr Yoon asked whether I would prefer a breakfast of noodles (another item he has hidden in his backpack), cooked at the hiking station just below Beopgyesa, or breakfast at the temple itself. I’m sorry to disappoint him. He likes to come fully equipped, and likes to use what he brings, but I want to have a look round Beopgyesa in the sunshine, so I elect for breakfast at the temple. Last year we had only seen it in the rain, but this morning we would see it to better advantage. We get back to Beopgyesa shortly after 8am. 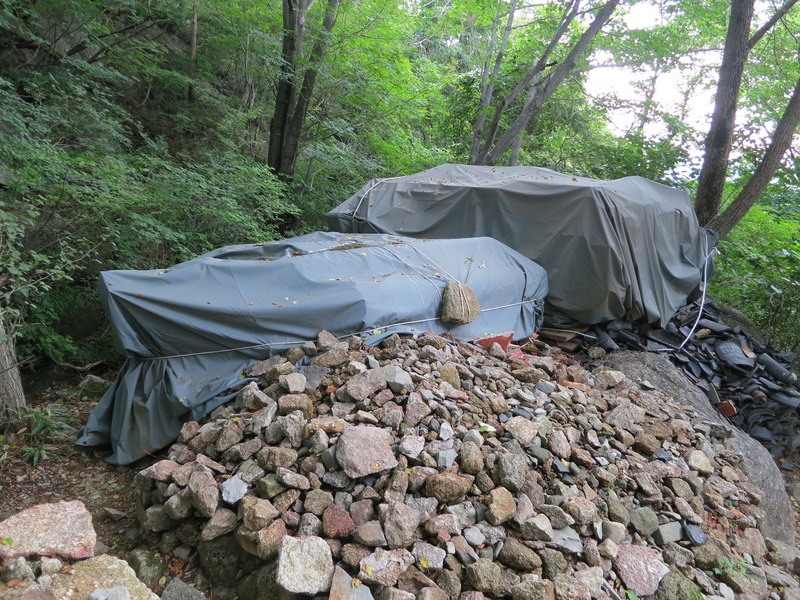 At the approach to its entrance, hidden under a tarpaulin, we notice a pile of rubble to the side of where the gate used to be. Presumably that is the remains of the entrance gate, which we had missed in the twilight gloom of the previous day as we hastened to our resting place. Clearly, when time, money and materials permit they intend to rebuild the gate.